Dinah with her friends that are walking to raise awareness for public school funding. Dinah couldn’t post today because she was busy yesterday. After going to church in the morning, she went with a few of her friends to walk with a Mom from our school who is walking from her home in Merriam (Johnson County, Kansas) to Topeka (approximately 60 miles). If you are interested in following her, she is posting updates on a regular basis to Twitter (@just1walk). Why would any person in their right mind walk to Topeka from the Kansas City area? 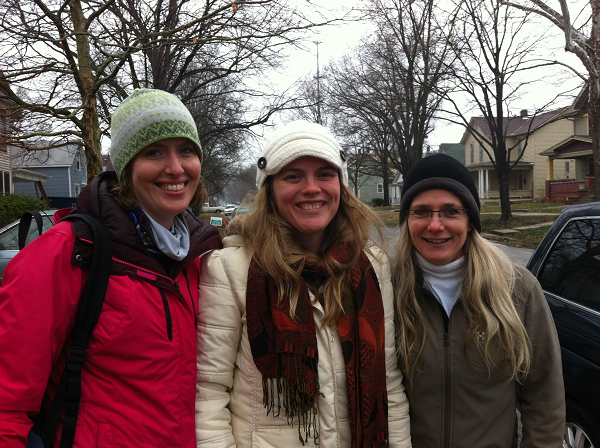 Our friend, Heather, is walking to raise awareness of issues related to public education in Kansas. As you may or may not know, Kansas is facing a budget shortfall. This shortfall is at least in part due to tax cuts. It seems as though those tax cuts were enacted without much foresight as to how those cuts would impact the budget. What is clear though is that in order to help balance the budget, some programs will face cuts due to the decreased revenue. Others programs will not have any increases even if funding levels remains the same. According to the Kansas Constitution, the legislature has a constitutional duty: “The legislature shall make suitable provision for finance of the educational interests of the state.” KS Constitution Article 6, Section 6 When you look at the schools, the legislature has provided many rules which make quite a bit of sense. For example: attendance is mandatory, schools have to hire certified teachers, and schools need to make certain kinds of progress in student achievement. Here is the kicker. If the legislature requires things of the schools, then they have to fund the schools at a level that allows them to meet the requirements. Two court cases (Montoy vs. Kansas and Gannon vs. Kansas) have affirmed this principle of funding. To state things clearly, if you make rules for the schools, then you have to provide funding at levels that allows them to meet those requirements. Seems fairly straightforward. Public education in Kansas has already been underfunded (at least according to the courts). Spending for students in the school year 2008-2009 was set at $4,438 per pupil. In the 2012-2013 year, funding was set at $3,838 per pupil. The present level of funding fails to meet the constitutional standard according to the courts. Now the funding decreases between 2008-2009 and the 2012-2013 school years, were due in part to the great recession. The courts told the legislature that they needed to fund education at a higher level. It seems odd that as the economy recovered the state would decrease revenues when one had already lost court cases unless one had planned all along not to comply with a legally binding decision. Now some in the legislature contend that these decisions represent “judicial activism” and that the judiciary is deciding how much the legislature should spend. What some in the legislature also fail to mention is that the courts are telling the legislature to fund education at the levels recommended by their own study. Perhaps the above is too much to absorb in one fell swoop. What I want folks to do is begin to get involved in this debate. If one mom is willing to walk all the way to Topeka to raise awareness in Kansas, than I wanted to take a small moment to advocate for the cause as it is one near to my own heart. My youngest son is in second grade in a class with 28 students. The idea that a second grade class could or should be that large seems ridiculous to me. It is time to get into the game. It is time for parents to become actively involved in this process. If you live in Kansas, get involved here. If you live in another state, chances are the circumstances you may be facing similar issues. 2 Comments on "Guest Post: Game on for Kansas Schools"